Saffron crocus bulbs are now available from several well-known home-garden seedsmen, who usually ship at the right time of year for planting. The bulbs you receive should be about the size of a healthy garlic clove. There are only two easy “secrets” to readily growing your own saffron: 1) do not let dormant bulbs get materially wet, much less sit in wet ground; and 2) harvest timely. (We’ll elaborate below.) A Spanish commercial saffron-grower’s web site says “The cultivation of saffron needs an extreme climate; hot and dry weather in summer and cold in winter.” Sound like any place we know? 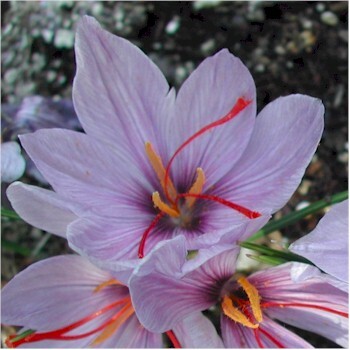 Modern saffron is entirely hybrid and does not set seed at all—all propagation is vegetative. “Cultivars” are very rarely mentioned by home-garden seedsmen in connection with saffron, though there are certainly plenty enough out there; premier types from around the saffron-growing world include “Aquila” (Italy), “Mongra” aka “Lacha” (Kashmir—Crocus sativa Cashmirianus, said to be an especially fine producer in northern gardens), “Superior” and “Creme” (Spain), and “Pennsylvania Dutch” (U.S.—known for its “earthy” notes). No bulbs offered at retail in North America are (so far as we found) identified by cultivar, and are very unlikely to be any of those prized sorts. What is most important, however, is that you buy bulbs only from a reputable seed house, making quite sure that what you buy are saffron crocuses, not autumn meadow crocuses (sometimes confusingly also called saffron crocuses); be utterly sure you are getting real Crocus sativus, not Colchicum autumnale. To grow saffron successfully, especially in our climate, it is essential to understand its life cycle. That cycle is like this: in the autumn, it sends up flowers that very soon die back; those are soon followed by “leaves” (which look a lot like a vigorous clump of grass, or perhaps scallions), which continue to grow through the winter, often reaching 18 to 24 inches; in spring, perhaps around April, the growth portion of its annual cycle ends, the leaves die down, and the underground bulb goes “dormant” for the warm months; then, with the return of autumn, the bulb breaks dormancy and sends up new flowers, and the cycle starts over. We need to know this because the one thing that will for sure kill off saffron is having its bulb be damp for any nontrivial amount of time during the plant’s dormant period. If a dormant saffron bulb sits in wet soil, it will very quickly rot completely away, leaving naught but a damp husk for the puzzled gardener’s probing fingers to find. So from roughly April to September (more exactly judged by the plant’s actual performance), it needs to be in bone-dry soil. Saffron is a variety of autumn crocus, which means—duh—that it flowers in the autumn; and it is from those flowers that we extract the precious threads that are what we call “saffron”. 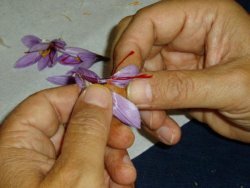 Saffron crocuses do not set seed, and so must be propagated vegetatively, by planting what are called “corms” (bulbs). Corms are initially planted in late summer or early autumn (your supplier should send them to you at the correct time, but it is as well to consult with them about your exact location and climate). If weeds poke up, cultivate but with great care: shallowly, with a light hand. When the plants’ leaves do start to die back, the plant is entering its dormant period, which will last through the entire summer. During that dormancy, the plants must be kept thoroughly dry; if they are not, the corms will quickly rot away, and when the frustrated gardener, seeing no bloom in autumn, explores the soil, there is literally nothing left there (or perhaps just a dry husk). Stop watering at the first sign that the leaves are browning and dying. And we emphasize again: don’t try to grow saffron by the calendar: let the plants themselves tell you where they are in their cycle. When the grassy leaves stop growing and begin browning and dying back, stop watering; when new growth appears, start watering modestly but steadily. Those things will happen in the spring and autumn, respectively, but the dates are up to the plants, not you. When the plants do break dormancy in the autumn, you can take the planter boxes outside to get sunshine for their growth (try to harden them off a bit before leaving them outside full time); when not dormant, saffron more or less requires good, full sun. Also try to keep them shielded from wind if at all possible—and don’t forget to protect them from varmints (including household pets). Don’t take them back inside till it gets really cold, say around 20° F (it is said that saffron can tolerate frosts as low as 14° F and even short periods of snow cover); and when you do bring them in, give them as much light as possible till the leaves finally die back. Each flower will yield three stigmas (filaments or threads), which dangle from the throat of the flower (see the images above and to the right). When you find a newly opened flower, wait till any morning dew has thoroughly evaporated, then cut the flower (sorry); some folk harvest the threads direct from the growing flower, but that multiples your efforts—painstaking at the best of times—substantially. Remove cut flowers to a convenient, breeze-free work area—say a well-lit kitchen counter—then take a pair of tweezers and gently and carefully extract the three red-orange filaments, or threads, that you find in each flower—each of which should be about an inch long. Make sure to take only the red threads: don’t mix in any of the yellow parts (harmless, but they dilute the actual saffron). Have a a secure container for plucked threads—at the least, an envelope—ready to hand, lest any blow away. When you are done, carefully transfer the threads to a small clear glass bottle; but don't cap the bottle till the threads have been dried. It is quite important to thoroughly dry harvested threads before capping up their bottle for storage. Some sun-dry them (taking due care that the ultra-fine threads can’t get blown away). Others use applied heat, which is OK if it’s gentle heat applied over some time—remember, we want to dry the threads, not roast them. Perhaps the easiest technique is to lay them on a paper towel, with a sheet of glass or clear plastic over them to keep them from blowing away, then leave them on a sunny countertop for a while. It was last modified on Monday, 4 February 2019, at 21:23 EST.